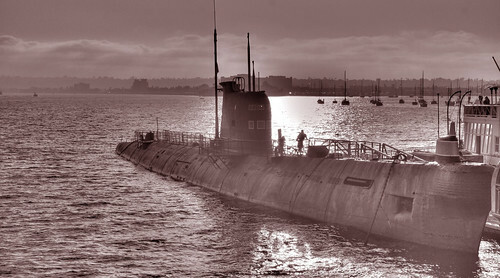 One of a fleet of diesel electric submarines the Soviet Navy called “Project 641,” B-39 was commissioned in the early 1970s and served on active duty for more than 20 years. 300 feet in length and displacing more than 2000 tons, B-39 is among the largest conventionally powered submarines ever built. She was designed to track U.S. and NATO warships throughout the world’s oceans. B-39, assigned to the Soviet Pacific fleet, undoubtedly stalked many of the U.S. Navy’s ships home ported in San Diego. Now, less than 20 years after the collapse of the Berlin Wall signaled the end of the Cold War, she will be berthed on San Diego Bay amidst her former adversaries. Soviet Project 641 submarines, classified as “Foxtrot” by NATO, are essentially larger and more powerful versions of German World War II era U-boats. Low-tech but lethal, she carried 24 torpedoes while she was on patrol-some capable of delivering low-yield nuclear warheads. B-39 carried a crew of 78 and could dive to a depth of 985 feet before threatening the integrity of her nickel steel pressure hull. The Soviet and then Russian Federation’s navies deployed these submarines from the mid 1950s through the early 1990s. They played a part in many of the Cold War’s most tense moments including the Cuban Missile Crisis. This is an HDR image.